National Wildlife Federation posted a great article this week about creating winter roosting places for birds. Birds seek shelter at night and in bad weather, and some may choose winter roosting sites that will become spring nesting spots. Some birds you might expect to find roosting in boxes include titmice, wrens, chickadees, and nuthatches. Here are some tips condensed from the NWF article – click here to read it in its entirety for full details. Some birds will use prefabricated (i.e. human built) roosting boxes. These resemble nesting boxes, but have perches inside near the top and entrance holes near the bottom to keep the warm air in. Buy one from Duncraft or build your own using these plans. Birds that don’t sleep on perches, like bluebirds, might prefer to use regular nesting boxes as roosts in the winter. (Here’s a great DIY bluebird house plan from BirdsandBlooms.com.) Add a layer of leaf litter or moss to the bottom for extra warmth. You can also use weatherstripping to seal off any larger cracks (unseal before nesting season, though, as these provide ventilation in warmer weather). Protect a roosting box from predators just as you would a nesting box. Mount the roosting box at least 10 feet off the ground on a metal pole to keep predators like cats and raccoons from attacking birds while they’re seeking shelter. Some people prefer roosting boxes with two holes to allow birds an escape route. 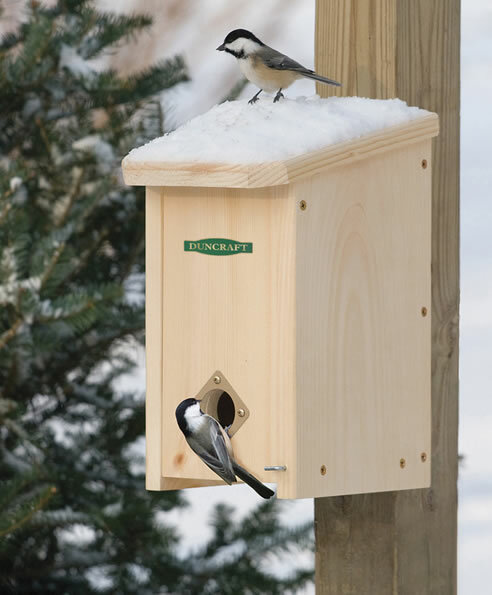 What do you do to provide shelter for birds in the winter? Give us your tips in the comments section below! materials. I enclosed the bottom with wooden edging that run 6 feet in length and are 4 inches tall. They come on stakes that you just push into the ground. I also did not do my fall clean up of my in ground and potted plants and have an abundance of dried foliage for the wildlife. We leave our fall tree and shrub cuttings in a pile in the corner of the yard need our feeders until early spring.This gives them dense, warm protection from the elements in the winter. We carefully remove it all in early spring to avoid any nests being built and disturbed. We have birdhouses and living shrubs and trees for those. I also use my Christmas tree for a wintering place for the birds. I leave it in the stand and set it just outside my living room window. I secure it to my porch railing then put small suet feeders in the branches. I also use the branches I pruned from a crab apple tree and place them inside, near the trunk of the tree. The birds love the apples still on the branches. This gives me the opportunity for some beautiful photos. I bought 2 Christmas trees and put them in my backyard. One I put up against the fence and the other I have close to my feeders. The birds seem to like the one tree that I have standing up by the feeders. I also sprinkle birdseed on the tree for extra food.I really like the idea of having the trees together, I’m going to try that next year.